I first learned of this game by prowling around the Indie section of PAX Prime 2013. Must have missed it on my first sweep, because a friend told me about “a cute looking game, kinda like Castle-Crashers, and you can play as a chimney-sweep!”, and it didn’t sound familiar. I made sure I stopped by the indie section again to try and find it. Why am I playing as the Monopoly guy? Am I on a stage? Holy crap I can combo!! A few weeks pass and Tasty Whale is sent a review key. Knowing this game was meant to be played in co-op, I called a friend over and we set to it. Entertaining story! You play as either Dashforth (1st player) or Scampwick (2nd player), retelling the tales of your time spent hunting daemons. Extensive bonus content such as a bestiary and notebook (check). The music score is diverse. It reminds me of old adventure movie soundtracks. The art is cute. The world is a stage, quite literally. Backgrounds move, prop additions, and costume changes give it a novel feel similar to what Kirby’s Epic Yarn did. At worst sometimes the audience look like characters from South Park. 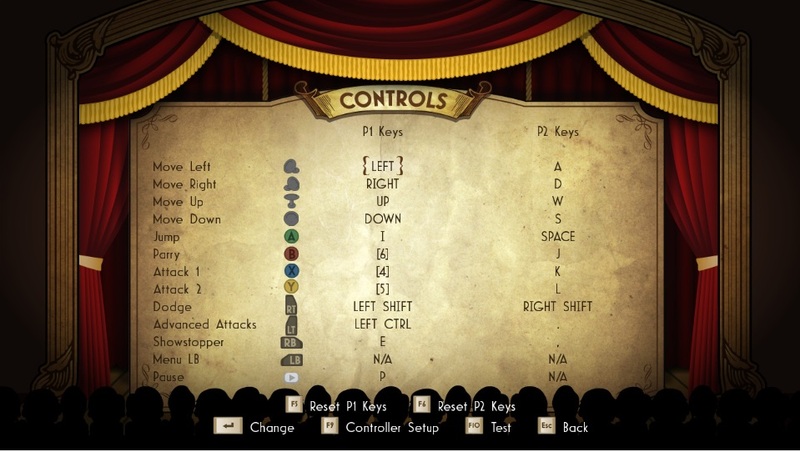 The combat can be played as simple as a weak-attack/strong-attack two-button arcade game, or you can learn to properly chain combos, dodge and counter attack (very similar to the recent Batman: Arkham Asylum/City games). I’m not going to say the controls or user interaction blew me out of the water, but it was entertaining and required some skill to do. Not mind-numbing, but you could play this while a bit distracted by a conversation. You don’t have health so much as audience interaction. The better the fights, the better your score. You have to win the audience by chaining combos, using a special power meter, or following audience directions (I kinda hate the little urchin in the audience!). 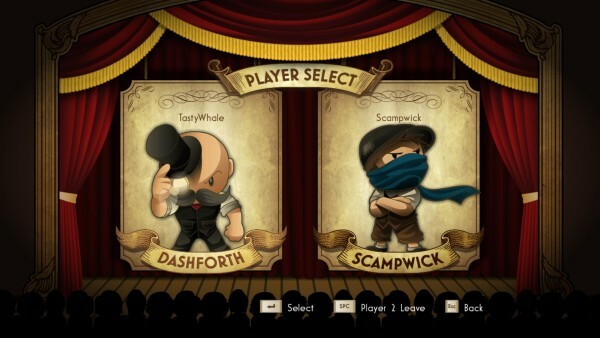 If you play alone, Scampwick will come out for a back-and-forth dialogue with Dashforth. Usually pretty entertaining. I noticed playing alone was actually more fun! I could better focus on where my character was at, string better combos (the enemies would focus on me instead of spreading across the screen). I think that playing single player even allowed the screen to zoom a bit, so that you are more the star than just a character on the screen. This may seem odd but instead of just looking at the gameplay mechanics, reviewing the writing or humor, or critiquing the audio/visual BUT I want to list a few issues I had with the game. Tasty Whale worked as a game tester for a while, so please bear with me while I nit-pick. NOTE the game hasn’t been released and these issues could be fixed in the release version. The first hurdle involved a self-imposed problem: The game allows for same-screen co-op, but I only have one wired PC controller. Going through the settings I was able to set the 2nd player controls to the keyboard. 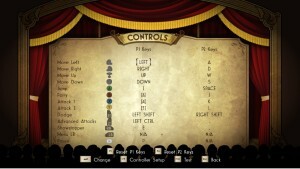 Oddly, it still showed 1st player as having keyboard controls. When we tested it both the keyboard and controller worked simultaneously, so we were set. It didn’t auto detect my screensize, so initially I was playing the game with a 12″ black border around it. A simple settings change (not available while playing, but accessible in the main menu) fixed the issue. Odd user interaction. Second player didn’t get their stats saved for a bit. Scampwick had definitely unlocked an item. However, once the tutorial text about it appeared for Dashforth, the item was no longer accessible for 2nd player. Quitting out and restarting it did restore the item to Scampwick. Again, these are minor issues in a preview build. The game is available on September 18th on Xbox Live Arcade and Steam. Disclaimer: Tasty Whale received a review code from the publisher.